Growing up, this dessert was served at many of my family's dinners. The creamy custard with the sweet golden caramel is a wonderful flavour combination and it's so easy to make. Served with coffee or tea, it's a perfect make ahead dessert to end any Portuguese dinner. Enjoy! 1. Combine the sugar and water in a saucepan and bring to a boil over medium high heat. When the sugar has dissolved, reduce the heat to medium low and let the sugar turn to golden caramel. Note: do not stir the sugar at this time...it will turn golden in about 12-15 minutes. Don't walk away from it as the sugar will go from golden to burned quickly. 2. Immediately pour the caramel/sugar into the mold (I used a bundt pan) and swirl the mold until the sugar coats the bottom (if you're using a metal mold, it will get hot so use pot holders when swirling the sugar). The caramel/sugar will harden at this point and melt again later as the flan bakes. Let the sugar cool completely before proceeding. 4. Preheat the oven to 350F. In a large bowl, combine milk, sweetened condensed milk, eggs and vanilla. Mix well. 5. Set the cooled mold in a larger pan and fill the larger pan with hot water to come halfway up the sides of the mold. Pour the custard mixture into the mold, over the cooled sugar. 7. Bake for 40 minutes or until a knife inserted into the middle of the flan comes out clean. The center should still be slightly soft, as the flan will finish cooking after it is removed from the oven. 8. Remove the mold from the larger baking pan and allow the flan to come to room temperature, then chill the flan for at least 6 hours or over night. 9. Before serving, run a sharp knife around the edge of the flan to release it. To serve, place a platter over the mold. Invert the mold and platter; shake gently to loosen the flan. 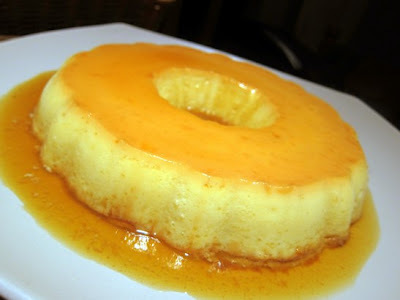 Remove the mold and allow the caramel to flow over the flan. It sounds fabulous. I've had more than my fair share of caramel troubles. This version sounds easy. Many parallels of this type of dessert in many cuisines and I love each & every one of them. One of my faves! gorgeous! makes me want to have one right now....In a very 'caramely' mood right now...First time on your blog...great find! There are several versions of this fabuluous dessert and I like them all. Yours looks amazing! I tried my first Portuguese flan at Christmas in individual sizes. There was also rice pudding and pasteis so there was no shortage of dessert!